What’s happening on the Johnny Cash Trail in Folsom this fall? Plenty! Phase II construction is almost complete, and the City of Folsom has a full line-up of exciting events planned to celebrate the completion of the trail. On Saturday, October 14, 2017, Folsom Parks & Recreation will hold a dedication and grand opening celebration grand opening celebration and you’re invited to join in the festivities. A free outdoor festival begins at 8:00 a.m. on the new trail section located behind the Folsom Rodeo Arena. A ribbon-cutting and dedication ceremony will officially open the second phase of the trail to the public at 8:30 a.m.
After the ceremony, you can be one of the first to experience the completed trail with a trail run or community ride. The free outdoor festival will be held in Folsom City Lions Park from 8 a.m. to 12:30 p.m. with live music by Manzanita from 10 a.m. to 12:30 p.m.
After the dedication ceremony, the Johnny Cash Trail will be officially open to all. What better way to check out the newly completed section of the trail than a run or community bike ride? The bike ride begins at 9:30 a.m. and two runs immediately follow. These family-friendly events are open to all skill levels. The bike ride and longer run follow a 6.2-mile course, while a shorter run/ walk takes participants on a 4.2-mile course. Run participants start on the newly constructed section of the Johnny Cash Trail behind the Folsom Rodeo Arena then head across the 190-foot-long, wood arched Robbers Ravine Bridge for some spectacular scenery. The run courses continue along the trail through Folsom State Prison property and beneath Prison Road at Natoma Street using the new bike/pedestrian tunnel. Runners continue on the trail toward the iconic Johnny Cash Bridge that spans Folsom Lake Crossing. The 4.2-mile run/walk is an out-and-back course with a turn-around and water station just beyond the Johnny Cash Bridge. The course finishes after runners cross the Robber’s Ravine Bridge on their return. The 6.2-mile run and community bike ride participants will continue over the Johnny Cash Bridge to the Folsom Lake Trail along Folsom Lake Crossing. At the end of the trail, the course transitions to the Jedidiah Smith Memorial Trail. Participants will continue to the historic Truss Bridge toward Leidesdorff Street in Folsom’s Historic District. Participants return to the Johnny Cash Trail for a final crossing of the Robber’s Ravine Bridge before crossing the finish line. The community bike ride finishes on Stafford Street, with free bike parking near the top of the Rodeo Arena. Rain or shine, the Johnny Cash Trail Community Ride and Runs take place on Saturday, October 14, 2017. Events start on the Johnny Cash Trail behind the Folsom Rodeo Arena, located near Rodeo Park, 200 Stafford Street; events finish in Folsom City Lions Park. Register for a Johnny Cash Trail Run or Community Ride. The trail will close for a private fundraising event at 1:00 p.m. after the festival’s end. Keep reading to find out what fundraising plans the City has in store for the art trail project. The grand opening festivities mark the end of trail construction and the beginning of the next phase: fundraising for the public art that will be placed along the trail. The Johnny Cash Trail is ultimately so much more than a multi-use bike trail that takes visitors past historic Folsom Prison. It’s also a world-class public art installation that will bring breathtaking pieces of art to the trail. 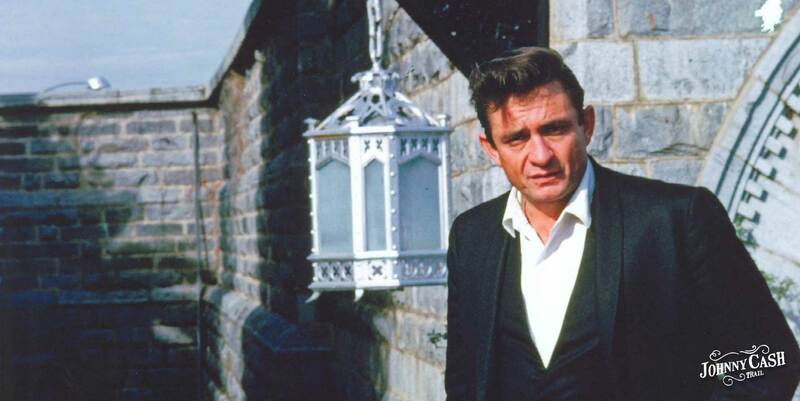 The Johnny Cash Art Trail will feature eight larger-than-life statues honoring the legacy of Johnny Cash and the impact the musician had on the City of Folsom. In order to fund the first two sculptures, a pair of corten-steel picks that mark the trail, the City is relying on donations and contributions from fans of the project within the community. A corten-steel donor wall has been installed near the Johnny Cash Trail overpass bridge and is quickly filling with the names of families, individuals, and organizations who want to be a permanent part of this exciting project. Gift contributions of any amount are being accepted via a contribute page on the website. Limited-edition Johnny Cash Trail cycling kits have been selling to benefit the trail. The City is also holding a private-event on the newly completed section of the trail itself to raise funds for the art installation after the free community festival, run/ rides, and grand opening ceremony conclude on October 14. The trail completion is nearing the end, but the Johnny Cash Trail project isn’t done yet. The extended trail offers runners, cyclists, and trail visitors a longer, more scenic ride filled with breathtaking views of the natural beauty and history in Folsom. But the best is still to come. Don’t miss out on the grand opening ceremony, free festival, and community runs/ ride on Saturday, October 14th -- it’s going to be a great day to be in Folsom.